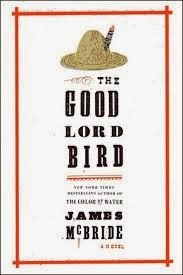 a book chick: "The Good Lord Bird"
my take: Several years ago I listened to The Adventures of Huckleberry Finn on tape in my van (yes, that's a few technologies ago) and absolutely loved the sound of the dialect. I thought of that recording as I read Good Lord Bird ... it's gonna make a great book on tape. Or CD. Or whatever. My sister started our book discussion by announcing it's on her top 10 all-time book list. BoOm. Mr. McBride is coming to the FF&W, so many in my family are trying to read this. When I mentioned to my mother what the book was about she said, "Oh, not another John Brown story." Novels about John Brown don't end well. And they're typically long (Cloud Splitter). Let me tell you, if I'm gonna read about John Brown, this is the way I want to do it: through the character of Onion, a teenage slave boy/girl. In Onion's words, John Brown (the Old Man) becomes a sympathetic and crazed soul, and the voiceless masses of Negros can be heard. You will laugh, and you will cry, and you will probably love Onion, too, and his gentle foreshadowing and turns of phrases. Woah, top 10? Guess I really better get on reading this one. I have to admit (and feel bad about this): books with slaves as central characters are kind of on my India/Russia/etc. type list. You know they'll be worth reading, but it's hard to pick them up because you know the poor characters aren't likely to fare well... Good idea to listen to it though (book on iPhone, these days).